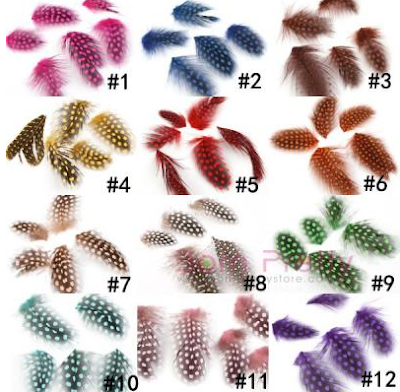 For $1.35 USD you get 5-7 feathers per bag, and they come in 12 different colors. Feather nails only require a handful of steps and they are pretty easy to accomplish! 1) Apply your base color. I chose Julep's Leah. Once it is opaque, wait for the last layer to become tacky. 2) Once your polish is tacky, place the feather on your nail, pressing it down gently, and do a rough trimming. By that, I mean just snip off the end with scissors so there is a little bit of feather past the free edge of your nail. 3) Wait until your base polish is dry and apply a topcoat (I recommend a thick, fast drying topcoat like Sally Hansen Insta-Dri, Seche Vite, or Julep Freedom Polymer Topcoat). 4) Allow the topcoat to dry and do a final trimming on the feather. 5) Continue applying topcoat, making sure each layer is dry before the next, and pressing down on the feather gently if necessary. Keep adding topcoat until the feather is completely encapsulated and there are no frays sticking up. Be sure to wrap your tip's edge with each layer of topcoat. The feathers will come off with regular remover when you take off your polish. You can see my index and ring fingers could have used one more coat of topcoat, but I was able to complete 5 nails with just 2 feathers! Overall, these feathers performed wonderfully! They didn't fray and fall apart a lot, like I have experienced with some before. This product was provided to me from Born Pretty Store for review. All opinions are both completely honest and entirely my own.